BringMeSports Toolbar is the PUP that uses misleading techniques to prevent removal. Use Reimage to locate malicious components and get rid of them faster than with uninstall instructions. A full system scan blocks virus reappearance and prevents traffic to malicious domains. 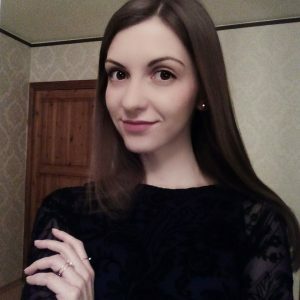 What is known about BringMeSports? What methods are used for spreading BringMeSports Toolbar? BringMeSports is a Toolbar that you may try to install on your computer after being convinced that it’s a great tool for improving your browsing experience. However, before you decide to download it to your computer, you should know that it is deemed as a potentially unwanted program (PUP). It means that it features some questionable traits and may function in an unwanted manner. Wonder what has made security experts to include this program to these categories? First of all, it’s clear that this program was created not only for helping people to improve their search sessions but also to serve third parties. Besides, after downloading Bring Me Sports to the system and using it for a while, you may notice an increased amount of pop-up ads on the pages that you normally visit. They may inform you about sales, discounts, coupons and similar things that are usually loved by people and can easily catch their attention. However, you should never fall for these ads. That’s because their purpose is not to increase your savings. Their task is rather to make people visit affiliate web pages and increase their page rank. You should also be aware of the fact that BringMeSports can easily track your browsing on the web and may collect your search terms, mostly visited websites and data that you add when visiting them. So, if you want to protect this data and browse the web without lots of issues, you should remove BringMeSports toolbar from your computer. To help you perform the removal of this app, our security experts have submitted the instructions that are given in the next page. If you consider this toolbar useful, you can use it as long as you want because it’s a legitimate application despite everything. 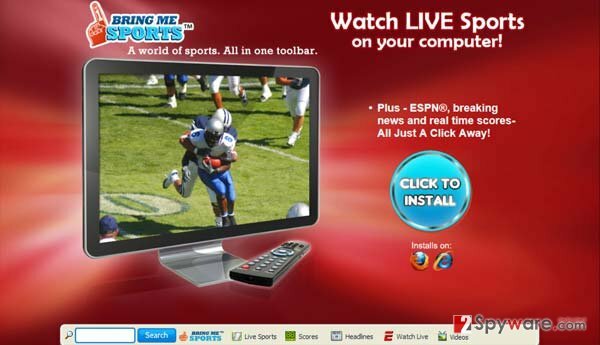 BringMeSports Toolbar can be downloaded from its official website but it’s not the only way how it is spread around. Beware that it has also been distributed in a bundle with PDF creators, download managers, video recording software, and similar free programs. These programs are typically spread for free, so to monetize the service, they may include various ‘free additions.’ However, you can avoid such programs by only choosing Custom or Advanced installation method of the freeware and then opting out from various add-ons, extensions, plugins, toolbars and similar applications. If you didn’t uncheck check mark that agrees to install this program on the system, you can expect to see altered search results, commercial ads, and similar annoying activities. In order to stop them, you should get rid of this freeware ASAP. Recently, the developer of this program contacted us asking us to remove this post from 2-spyware.com website. We believe that we shouldn’t do that as long as programs that we offer for the removal of BringMeSports Toolbar can detect it and help users to remove it from the system. As it is mentioned under each of download buttons, we ARE affiliated with these anti-malware programs, and while some of them are free, others can remove a virus only after purchasing them. These mentions fully fulfill each of the requirements of FTC. 2. When in the Add/Remove Programs/Uninstall a Program, look for BringMeSports Toolbar and other programs that are unknown to you. 2. Here, select unfamiliar plugins (BringMeSports Toolbar, MyWay, MyWebSearch, etc.) and select trash icon to delete these entries. This entry was posted on 2015-10-07 at 03:35 and is filed under System tools, Viruses. You can quickly scan the QR code with your mobile device and have BringMeSports Toolbar manual removal instructions right in your pocket. How did you remove BringMeSports Toolbar?